Aussie nice guys finish first? The ex-boors didn’t turn into bores. They chirped and chattered; urged and cajoled; played mind games and the ball game. But Australia’s cricketers preferred smiles to snarls, and to kill ’em with kindness, on day one of a fresh warm and fuzzy era. The Australians had scant cause to vent any frustration against India for much of Thursday’s opening day of the first Test at Adelaide Oval. 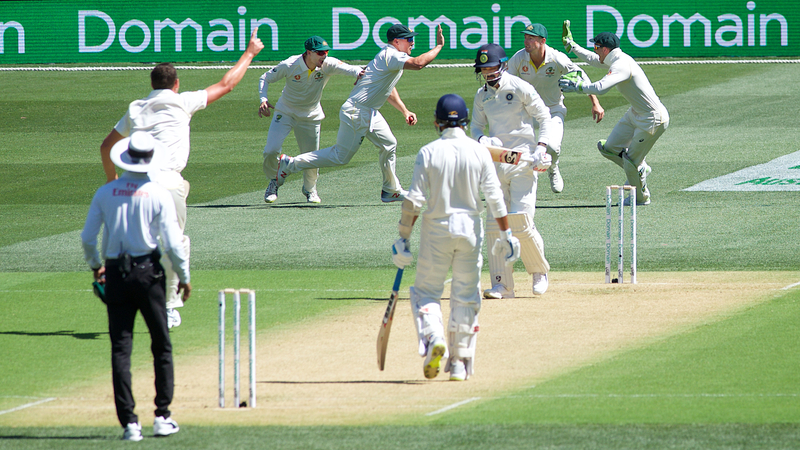 As Indian wickets fell frequently, the Australian fielders chatted incessantly. They were vocal in support and encouragement of their bowlers who barely said a word to their opponents, especially Indian centurion Cheteshwar Pujara, who made 123 as wickets tumbled around him. “That is something I can’t say a lot about,” Pujara said of Australia’s softly-softly approach. “When you play Test cricket, your focus is always on cricket. “And when I am batting and the opposition is trying to sledge me, I am actually not bothered about it because my focus is always on batting. Australia’s bowlers opted to menace with the ball – not the mouth. When Indian opener Murali Vijay edged the first four of the series through a gap between slips and gully from Josh Hazlewood, the paceman simply muttered under his breath. When Mitchell Starc beat the bat of Rishabh Pant, the fast bowler’s prolonged follow-through was accompanied by a broad smile. When Starc did the same the next ball, he responded with a similar smile. And when Pant soon after aimed a wild slog, and missed, from Pat Cummins, the paceman strode down the pitch with a wide smile. But Australian captain Tim Paine conducted a vocal chorus which was aimed at his teammates – not the opposition. Paine, who 13 months ago wasn’t even wicketkeeping for his state side, spoke pre-game of Australia’s quest to win not only the game, but also respect. Thursday was the first day of the first home Test since the ball-tampering scandal which led to suspensions for Steve Smith, David Warner and Cameron Bancroft from a bitter series in March in South Africa. Much water, mainly troubled, has since gone under the proverbial bridge. There were reviews detailing a disturbing culture of sledging, arrogance and a win-at-all-cost attitude within the Australian team’s insular bubble. Early evidence from day one in Adelaide suggests that bubble has burst. But a truer test will come in harder on-field times with the new behaviour perhaps evidence of the oldest of adages: winners are grinners.